How To Buy The Best Sound Bar - Which? A sound bar is the simplest and often the most cost-effective way of giving your TV a much-needed audio boost. A sound bar is a compact speaker system designed to improve your TV's audio. 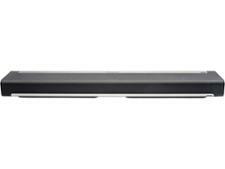 Sound bars contain several speakers in one long bar-shaped box - much easier to set up than a full home cinema system. We’ve tested the latest models from all the biggest brands to help you avoid making a costly mistake. Do I need a sound bar with a subwoofer? Just want to see which sound bars we recommend? 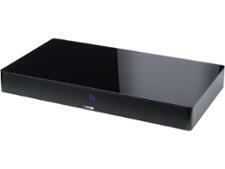 Take a look at our best sound bar reviews. Watch our video to find out which type of sound bar is best for you. A great sound bar will take your home entertainment to the next level, giving you exciting bass and audio clarity that means you won’t ever miss a word of dialogue. Where will the sound bar go? Can it sit comfortably in front on your TV? Does it need to be wall-mounted? To make dialogue sound clearer? A simple model to enhance TV programmes? A model that makes films sound great? Certain features such as the ones discussed below (e.g. wireless connectivity, surround sound, a subwoofer)? If your TV isn’t wall-mounted and you have enough space, you may be better off with a sound base because they have larger speakers so they tend to have better sound quality. For more information, check out our top three best sound bases in 2019 guide. Beyond great audio quality, there are a few things you should expect from a good sound bar. Many sound bars have a ‘sweet spot’. This might sound like a good thing, but it actually means there’s one specific sitting position at which the sound bar sounds best, and quality deteriorates as you move away from it. If you regularly share your TV viewing with friends or other family members sitting around your living room, you’ll want to pay attention to our ‘different angles and distances’ scores in our sound bar reviews. This tells you how versatile a sound bar is when you’re not sitting front and centre. A common reason for getting a sound bar is to make speech in TV and films sound clearer. Typical TV speakers can make dialogue sound muffled and unclear. Most sound bars come with an external or built-in subwoofer for extra bass. But the bass can sometimes be too harsh and overpowering, which can leave you straining your ears to make out what characters are saying. Some sound bars have a voice enhancement setting designed to sharpen dialogue. Not all actually work well though. We evaluate the speech sound quality of each sound bar to weed out models that have below-average speech quality and will leave you resorting to pressing the subtitles button. Our best sound bars make speech sound crystal clear in TV and films. In addition to wired connections, most sound bars come with Bluetooth. 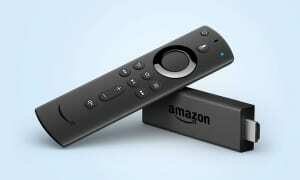 This is great if you want to use your sound bar for listening to music without having to turn on your TV. 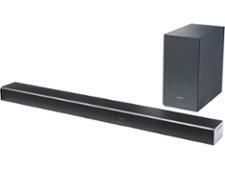 More sound bars are coming equipped for wireless multi-room music streaming. By pairing speakers together around the house, you can enjoy seamless access to your music library in multiple rooms. Sound bars with wi-fi are able to become part of a multi-speaker, multi-room music system. You’ll need other compatible speakers of the same brand in your home to make use of this. A sound bar that’s easy to use will be a great long-term investment. Look out for fiddly remote controls in particular, as these are easily lost and often have tiny, hard-to-press buttons. If you’re buying a big sound bar, it might block the signal between your remote control and your TV. Sound bars with built-in IR (infra-red) repeaters negate this problem by forwarding the signal from your remote control to the TV. 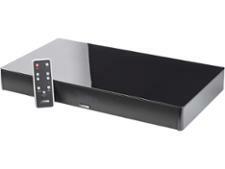 Sound bars that have a display and controls on the device tend to be easier to use. Many sound bars now have simple LED displays that let you switch audio sources and adjust sound settings. But some can be very hard to use, which is something we pay particular attention to in our reviews. Any good sound bar will have at least one digital connector: optical, coaxial or HDMI. These minimise interference compared with lower-quality 3.5mm audio jacks that you find on cheaper sound bars, and allow for special features such as virtual surround sound. 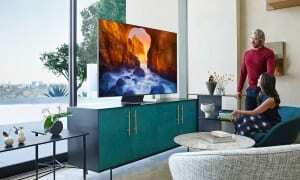 The best sound bars will offer HDMI ARC connections. Additionally, models with HDMI-CEC will allow you to use one remote to control both your TV and the sound bar. For more information, read our guide to setting up a sound bar with a TV. 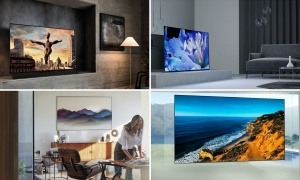 They sit in front of your TV, so sound bars should be well-designed with at least some thought given to style, without making them stand out so much that they become a distraction. Furthermore, any buttons on the sound bar itself should be within easy reach and not require you to have to contort your body into an uncomfortable position to make adjustments or change audio sources. Dolby Atmos is the newest innovation in surround sound and is one of the most sought-after sound bar features. A sound bar with Dolby Atmos should create a convincing surround sound experience that matches a multi-speaker home cinema set-up. Originating from cinema theatres, it’s described as object-based sound meaning that the movement of objects in films will sound very realistic and it bounces sound off the walls and ceiling to create an immersive surround sound experience. So rain and bullets in films and TV can be heard and felt above and around you. We’ve tested these models that have Dolby Atmos. Some also have DTS:X, another ground breaking surround sound format. 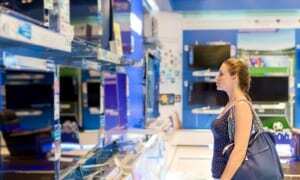 Among these are a Best Buy – and a Don’t Buy. Built-in voice control is becoming an increasingly popular sound bar feature. A sound bar with built-in Amazon Alexa works as a voice assistant in the same way that an Amazon Echo or Echo Dot would, allowing you to use voice-control to play, pause and rewind TV. Some sound bars are compatible with Alexa-enabled products, meaning that if you own an Alexa product like an Amazon Echo, you can use it to control the sound bar. Unlike with models that have Alexa built-in, you’ll have to speak to the Alexa-enabled product rather than directly to the sound bar. Additionally, some sound bars have Google Home built-in or are compatible with it so, if you own a Google Assistant, you can use it to control the sound bar with your voice. These are the best sound bars we've tested and will help you to get the most out of your flatscreen TV. Our expert lab awards Best Buys to the sound bars that have excellent sound, are easy to use and have outstanding features. This model provides powerful, dynamic sound and clear speech. It’s able to create an immersive and authentic surround sound experience, making music, TV and music sound excellent. And the straightforward set-up, simple remote and display make it very easy to use. This excellent model sailed through our tests, impressing our listening experts with its ability to create a true surround sound experience. It has a speech setting which makes dialogue sound sharp. And it also has a Music Mode which we found makes music sound brilliant. This high-end sound bar makes whatever you’re watching or listening to sound amazing. It does a perfect job of creating believable and immersive virtual surround sound. Speech sounds clear and sharp plus this model has many impressive features. We struggled to find anything bad to say about it. It’s been a while since we tested this model but it’s still one of the best sound bars we’ve experienced. Not only is it stylish but it has high-quality, captivating sound and great speech clarity, especially when using the speech setting. However, it’s not the easiest model to set up and using more advanced features could be daunting for some. This is our cheapest Best Buy and it did better in our tests than most of our other best sound bars. This is a small sound bar with big sound. Good audio quality with clear dialogue and sound effects make it an obvious Best Buy at great value. It comes with kit designed to help it deliver a convincing surround sound experience. Whilst its attempt at surround sound isn’t perfect, it’s still good. 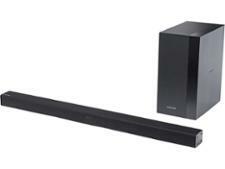 This sound bar is also very easy to set-up and use. 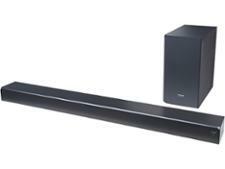 Sound bars can offer the complete package when it comes to sound quality, and many people will be happy with the depth of base a standalone sound bar can provide. Sound bases in particular are capable of delivering great bass all by themselves. Most sound bars these days come with a subwoofer and some have it built-in. Sound bars that don't come with a subwoofer can usually be paired with a compatible one that can be bought separately. These external boxes do all the bass work, dramatically increasing the punch of your audio setup. They can come at an extra cost and it’s yet another object in your living room, which might negate the practicality of having a simple sound bar in the first place. Nonetheless, external subwoofers are common and the majority of them connect to the sound bar wirelessly, meaning you can place it anywhere in the room without having to trail cables around your lounge. Our reviews have found these to be a very mixed bag, with some subwoofers totally overpowering the sound no matter where you’re sitting and others delivering the bass notes so late it’s distracting. It pays to do a little research.